Austinites be aware: January 1 will bring new rules to the road in the city of Austin that prevent you from operating a device while driving your vehicle or bicycle. For several legislative sessions, Texas lawmakers have tried and failed to have laws banning the use of cell phones while driving be signed into effect. The result is a group of cities that have adopted similar regulations despite Texas’s passing a statewide ban. Austin is the newest city to pass these regulations. The regulations expand on the prohibition of texting while driving to include prohibiting drivers from touching their electronic devices while the vehicle is in motion. These devices include phones, GPSs, laptops, and tablets. The penalty for violating the new ordinance is up to a $500 fine. If the vehicle or bicycle is not in motion, including at a stop light or stop sign, the driver is permitted to use their device. Several news outlets have proposed helpful alternatives to using the device while driving, including Austin’s Community Impact. 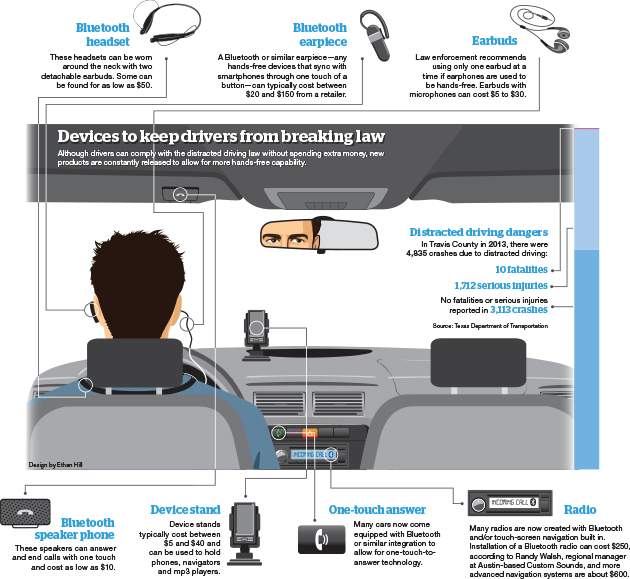 Among the proposed solutions are headsets, earpieces, earbuds, and car speaker systems. Remember to follow the law and be a safe driver.